It’s that time again. Exams are upon us, and Douglas College students are gearing up for some serious study time. To help you get through it all, the Learning Centre is hosting Exam Jam, which will include a kickoff event, study groups, tutoring and more. Exam Jam Kickoff is a fun way for students to de-stress before hitting the books. 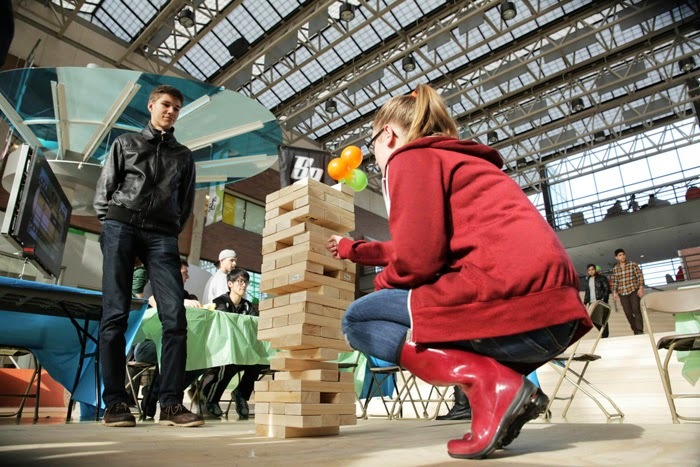 Join the Learning Centre in the New Westminster campus concourse on Thursday, April 10 from 11am-2pm for a Bhangra dance performance, giant Jenga, video games, prizes and more. Also that day, there will also be a relaxing yoga/hypnotism class in room 2221 on the New Westminster campus from 2:30-3:30pm. To sign up for the class, please drop by the Learning Centre or send us an email at learningcentre@douglascollege.ca with your name and student number. Tutoring: The Learning Centre’s New Westminster campus location (room 2105, in the library) will be open for business during regular hours on April 14-17 and 22-25, and the Coquitlam campus location (room A1040, beside the atrium) will be open from April 14-17. We encourage students to book 25-minute tutoring appointments for study skills, writing, computer skills or course content. Students can reserve a spot by booking online at the Learning Centre webpage. Study Groups: Often, two heads are better than one. And multiple brains are even better. The Learning Centre is holding study groups at the New Westminster campus for PSYC 2300, ACCT 1110, ACCT 1210, ACCT 2320, CHEM 1110 and ECOM 1150. At the Coquitlam campus, there will be groups for FINC 1231 and CSIS 1175. Study groups will be led by our experienced peer tutors, and students can book a spot online at the Learning Centre webpage. DSU Puppy Room: The DSU Puppy Room is back. Come by the Douglas College Student Union at their New Westminster office on April 14 and 15 from 11am-2pm and pet a pooch. The puppies are on loan from the nice folks at the Pacific Assistance Dogs Society. Cultural Café: The international department is hosting two afternoons of coffee, tea and light snacks as a way for international and domestic students to socialize and network. Take a break from studying and visit the Cultural Café on April 15 and 22 from 1-2pm in the DSU Boardroom (Room 207).